While Morgantown furniture outlets has been closed permanently, there are a lot of other options in Pennsylvania. Find one close to you or plan a trip to visit several outlets to find the perfect furniture for a specific room or your entire home. The Pottery Barn Outlet is one of Pottery Barn's eight outlets and features stock from Pottery Barn Kids and Pottery barn stores. Shop from overstocked furniture to furniture purchased just for the outlet stores. According to The Krazy Coupon Lady you can expect 10% -50% off the retail price. The sales at the outlet are final with no refunds or returns. The phone number is (717) 290-2809. 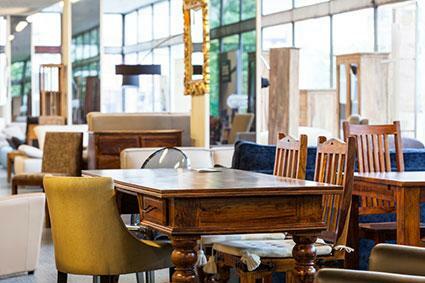 The National Furniture Outlet offers a variety of furniture at discounted prices. Occupying a 14,000 sq. ft., the store sells a name brand furniture. Shop for furniture styles for your entire home. Store delivers within a 100 mile radius. (See Morgantown listing below for second store location under a different name, National Furniture Liquidators - both stores owned by same company.) Their phone number is (717) 617-2424. Natural which a clear finish available only as a custom order. All of the furniture pieces are made in the USA. EFO Furniture Outlet (Eynon Furniture Outlet) claims to be the largest furniture dealer serving the Northeast and Central Pennsylvania. EFO features furniture purchased from overstocks, closeouts, unclaimed shipments and other great deals. You can find traditional to contemporary styles in solid woods and leathers. Home delivery is provided to the general Northeast Pennsylvania region with the same delivery fees regardless how much furniture delivered. A convenient layaway plan allows you up to six months to pay for your furniture. There are two locations. The Dunmore outlet is a liquidation center of name brand furniture. The Wilkes-Barre outlet features three designer decorated showrooms. Merchandise is sold 'as is'. No manufacturers' warranties are applicable. There are no service or extended warranties. They do not offer layaway. All merchandise must be picked up within 48 hours. Sears Outlet sells all kinds of products from their other holdings and have a wide range of furniture as well as mattresses. You can make your purchase online and then take your pickup receipt to your local store or for an additional $71.99 you can have home delivery if the outlet is supported by Sears Home Delivery Service. Some products (eligible products weight less than 130 lbs.) are shippable. You can get national delivery, but the pricing is based on distance. Furniture and Mattress Discount King sells closeouts, buy outs and discontinued furniture. The website advertises "lowest prices in Pennsylvania or it's free." This guarantee refers only to "identical, first-quality merchandise that's publicly advertised by any competitor in Pennsylvania at the time of purchase." You must provide proof of the advertised price. The guarantee is limited to in-stock merchandise only. The website also states that you can be approved for a line of credit, even if you have no credit, or bad credit. The stores also offer layaway. Whether you're furnishing a whole house, college dorm, first apartment or a single room, shopping at a furniture outlet can save you anywhere from 20 to 80 percent. Make sure you fully understand the conditions of the sale, since some outlets have a no return/no refund policy. If you don't find what you're looking for on the first visit, you may want to visit frequently since the inventory is constantly changing. Ask someone at the store how often new shipments are placed on the sales floor. You can often find one-of-a-kind pieces at some of these outlets.